Go to any Cars & Coffee and you'll see at least four Cobra replicars. You know what you won't see? 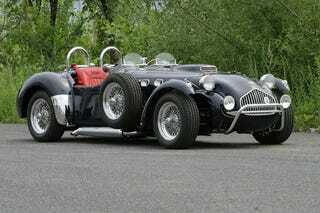 An Allard J2X replica. It's the American V8-powered English car no one remembers. And that's precisely why we want it. Allards were putting V8 powereplants into European bodies in the 1930s, before Carroll Shelby even though of creating the Shelby Cobra. In fact, Carroll Shelby raced Allards in the 1950s and there's no denying the influence it had on him. Sadly, most of the Allards lack the visual presence of an AC Cobra with massive fenders. A notable exception is the Allard J2X, which was designed specifically for American tastes and eventually powered by a Cadillac V8. The J2X combines the front of a Lotus Seven with an aggressive rear reminiscent of the Cobra to create something 100% wonderful. Now a group of Canadians is rebuilding the Allard J2X MKII in limited numbers powered by a 350 hp Chevy Ram Jet 5.7-liter V8, although you've also got your choice of a 5.7-liter or 6.1-liter Hemi V8 if you prefer a Mopar mill. The price is upwards of $100K, but worth it if you don't want to be just another anonymous Cobra.